Shaikh Hamad registered the race’s fastest lap of 1min 17.177secs. 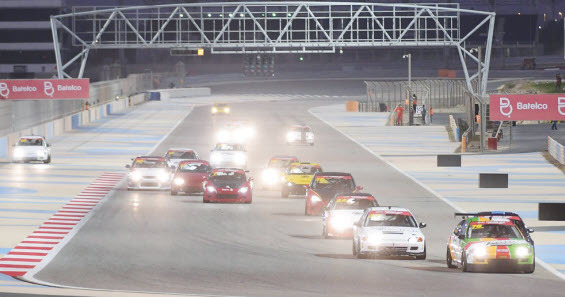 In the second sprint, he started from sixth with Shaikh Salman right behind and Salerno up front. Shaikh Hamad was able to power to the front this time and win a shortened race with an 8.046secs gap ahead of bin Khanen. Tareq Al Tajer, in a red Focus, came third overall 10.608s from the winner while also completing the Pro class podium. Shaikh Salman was forced to retire from the race five laps in. Himmo, Salerno and Martyna Al Qassab in a blue Honda Integra DC5 were the top three in the Novice category. Shaikh Hamad once again clocked the fastest lap with a time of 1min 17.223secs. Meanwhile, Al Muyini and Samee each enjoyed a perfect round, securing first place in each of their sessions from practice to race two while also posting their races’ fastest laps. Al Muyini once again led Al Gharabally to the finish, this time by just 2.127secs. Adel Najjar came third 5.474secs back.